The majority of people looking for motivation will wait for something, or someone, to come around and motivate them before they can get up and take action to motivate themselves. I operated with this “motivation comes before action” mentality for years before finally realizing that I had it all backwards. I would look for ways to get motivated to workout, to get up early, or to stop procrastinating and do my work. And I’d be motivated about doing these these things for a little while, but shortly thereafter, the motivation would fade and I’d stop taking action. Then I realized that the lifespan of motivation is a lot like the honeymoon phase of a new relationship—it’s really exciting at first, but that feeling doesn’t last. A relationship needs to be tended to, with small and thoughtful actions, in order to sustain itself. Motivation works in a similar way. We need to take small and thoughtful actions to keep the motivation train moving along, or else it’ll lose steam and come to a screeching halt. 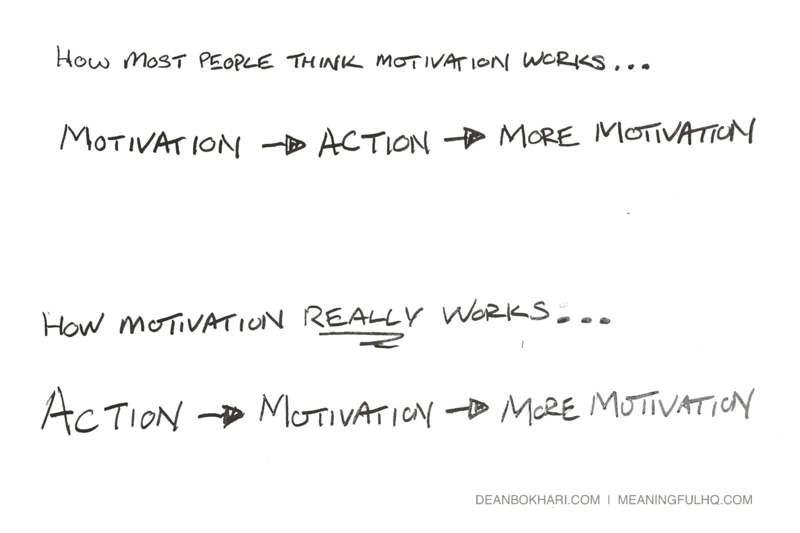 This realization led me to a simple discovery, which I now believe is the most important thing you need to know about getting motivated: Action leads to motivation. Regardless of what you want to get motivated about, the answer always begins with action. Action is the impetus for motivation. Action is the precursor to motivation. Action comes first, motivation comes after. Write that down and put it in front of your face. Whenever I feel hesitant about taking action towards a goal, it’s usually because I’m thinking about the big picture, and I feel intimidated by it. Now, thinking big is a good thing when you’re setting goals, but it’s a bad thing when you’re working to achieve those goals. Whenever I set a goal or decide to take on a project, I’ve realized that the key to getting started is to make it as easy as possible for myself to do so. For example: writing a 2,000 word article is a large project with several specific actions that need to be taken on my part prior to me hitting the Publish button. If I think about all the stuff that goes into doing it, I’ll easily find myself saying, “Screw it, let’s Netflix and chill.“ But then it wouldn’t get done. So, instead of giving up, I tell myself, “Okay, for now, I’ll just start the introduction.“ And before I know it, I’ve already finished writing over half the article. The key, I’ve realized, is not to wait for motivation, but to take some, small, specific action to get the ball rolling. And once I’ve gotten the ball rolling, it begins to gather momentum, and the motivation to continue arises naturally and on its own. The lesson here, is to develop what I call ”Action Ramps” around the things you feel demotivated to do. The idea of an Action Ramp is to choose a small and simple thing you can do right now that gets you going—an action that allows you to ramp-up towards the motivation you desire, which then leads to more motivation, which then leads to more action. Doing this results in a continuous loop of taking action and feeling motivated, and then taking more action and feeling more motivated. No matter what you’re trying to achieve, if you’re demotivated to do it, it’s because you’re not taking action; and if you’re not taking action, it’s probably because you’re overwhelmed by the size of the task you’ve got in front of you. So, before you shrug your shoulders and spend the rest of your day watching Netflix, try choosing one simple action that inches you closer to the finish line, and then… simply get started. Want to get motivated to workout? Don’t start by thinking about your workout if doing so has overwhelmed and prevented you from working out in the past. Instead, choose a simple Action Ramp, like putting on your gym clothes. This minuscule action—putting on your gym gear—will often trigger your mind to direct you to the next appropriate action related to what you just did—hit the gym. Want to get motivated to stop procrastinating and do your work? Rather than thinking about the thousands of different things you have to do today, a good Action Ramp would be to pick your one most important project right now, and then pick one simple thing you can do in this moment to move that project forward. Or, if you need to reply to some uncomfortable emails, tell yourself that all you need to do right now is simply start typing your replies, you don’t have to send anything yet. Then, set a timer for 15 minutes and start writing your responses. Don’t worry about etiquette, you can address that later. Don’t even think about finishing, you can save what you’ve started in the draft folder if you need to. The idea is to just get started… You’ll naturally find yourself coming back to finish soon enough. Want to get motivated to get out of bed? If you want to get up by 5am every morning, but you normally rise at 7am, a good Action Ramp would be to start by waking up at 6:45am for a week. Once you’re used to that, ramp-up to 6:30am. The week after that, 6:15am, and so on until you’ve hit your goal of consistently waking up at 5am every morning. Notice that each and every one of the aforementioned examples relies first on action rather than motivation. Why? Because the action itself produces the motivation to continue taking further action. Take action → get motivated. Take a minute to think of something you want to do if only you could get motivated enough to do it. Write it down. Next, create an Action Ramp. Think about one single, simple, action you can take today to make progress towards it. Write it down. Commit to yourself that no matter what happens, you’re going to take this action. No matter how tired you are, or how de-motivated you feel, promise yourself that you’ll do something—even if it’s the smallest little thing—to move the ball forward. Because the moment you get moving—the moment you start taking action—you’ll start feeling motivated, which will lead to more motivation, which will in turn lead to even more action. And the cycle will continue, so long as you continue taking action. Remember: Action leads to motivation, and not the other way around. Any action is better than no action at all. Stop waiting for motivation, and start motivating yourself.